It's good to be back! Here's a card I created with the NitWit Collections papers free with issue 3 of Simply Homemade and Sketch 112 over at Card Patterns. I'll have some more to share with you over the weekend. You know what I was tempted to buy that magazine the other day and decided not to - wish I had now - those papers are wonderful! Just love this card Vicky - it's simple elegance and just beautiful! such a pretty card...love how girlie it is! Thanks for joining us at Card Patterns! Love this! 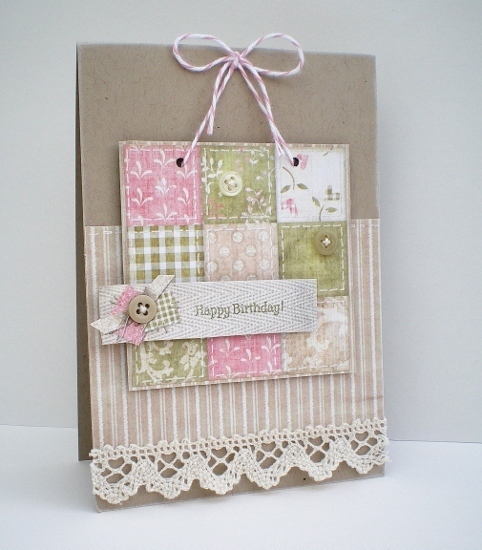 The layout is lovely, I especially like the lace edge, and colours co-ordinate so well together. A very pretty card. Such a beautiful card Vicky, really love the papers and lace. Great take on the sketch and very pretty. I have some quilt stamps that would be perfect for me to use while lifting from your card. Thanks for the inspiration. Another beautiful card and once again, so elegant. Gorgeous, Vicky! Love your work! Thanks for joining us at Card Patterns!! !